I read yesterday on the CBC website that the remaining Blockbuster stores in Canada are closing. If this is in fact the case it means that the two remaining video stores in all of Medicine Hat will disappear. I understand the reasoning and the progress behind this shift, and I love the Internet for bringing hard to find titles and obscure documentaries straight to my living room. 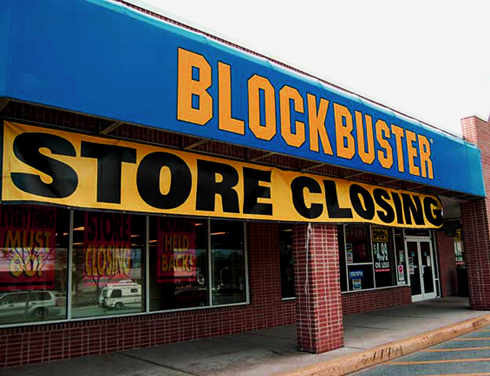 It's hard not to be nostalgic about this though, because in all honesty, I've still be renting movies from Blockbuster and taking advantage of their previously viewed DVDs and Blurays. In a way I'm kind of surprised that the shift has come this quickly. As a kid I remember going to Crazy Mike's Video Store and browsing the VHS tapes and Super Nintendo games. Renting a movie with the family was a Friday night ritual. As a teenager I remember going to Video Update every Tuesday for their 99 cent rentals. Then they turned into the Movie Gallery and Blockbuster finally came into the picture. Now one after another they have all closed (or are in the process of doing so). I still like the idea of leaving the house to browse cover art, to read the descriptions, to accidentally stumble onto something you hadn't before, and to explore. Even if your plans only consisted of renting a movie for the night, it was always fun going with friends to pick something out. I hadn't really given the process much thought until I read this article, but going to rent a movie with someone has (in my opinion) always been the best way of appreciating and/or arguing about your varying tastes in movies. Sure, things probably won't change that dramatically for most people. The video store will be one of those things that we realize has disappeared and then recall how we hadn't been there in years. But, at the price of convenience, we're finding more and more ways to not interact, to not engage, and to not leave the house. Netflix, iTunes, and the Internet in general are all brilliant, but as we switch from tangible items to digital files I feel like we're losing something. I did just buy myself a new record player though, so I have a feeling that even as the market evolves there will always be a place for folks like me who care as much about the experience as they do about the product. This is definitely sad news. The first thing I did when I moved to Regina was get a Blockbuster membership. We'll still have Rogers, but I also enjoy the previously viewed. It is a nostalgic thing for me too. I remember as a kid heading down to the loacl video mart to rent movies with my parents too. I more remember getting to go an pick a movie for my birthday parties. Twister and Nightmare Before Christmas to name a couple. My god, I just remembered - I also discovered Back to the Future this way.... wahhhhh! Whatever, at least we grew getting that stuff. When you have kids, anyways, you'll have enough DVD's it'll be sorta the same thing for them as it was for you. Heading to dad's movie room to pick a movie to watch on a Friday night. Oh, memories WILL be created. I'm an older duffer and yes, times have changed and we've changed too. I remember before Blockbuster. Dad would drive Mom and me the two miles to downtown to the Majestic Theater to watch a movie. We all shared one box of popcorn. They bought their first TV the year I went away to college. Then I was married and Blockbuster came along. Every Friday was date night. We drove two miles to the Blockbuster to pick out an evenings worth of movies. She died a few years and I didn't go back anymore. Years passed and there is a new lady in my life. We read together - audio books over the internet. She lives thousands of miles away and yet we are together. This week we began looking at rings together - over the internet. We keep Google Talk connected between us pretty much day and night so its almost like living together. Tonight though I let her down by sleeping through her "plunk" on Google Talk when she was attacked on Evony. Sigh. I put the first ever full length english language movie subtitled in Croatian on my YouTube channel sometime back. The little old ladies back home love me for that. They never had Block buster. They skipped over that and went straight to the internet. Times change. We mustn't forget what was good about the old way and find some way not to keep everything that was good.